If you notice any type of lens distortion in your photos from your Nikon D5200, try enabling the Auto Distortion Control option on the Shooting menu. This feature attempts to correct distortion as you take the picture. Or you may prefer to wait until after reviewing your photos and then use the Distortion Control on the Retouch menu to try to fix things. Certain lenses can produce a type of distortion that causes straight lines to appear curved. Wide-angle lenses, for example, often create barrel distortion, in which objects at the center of a picture appear to be magnified and pushed forward — as if you wrapped the photo around the outside of a barrel. The effect is perhaps easiest to spot in a rectangular subject like the oil painting in the figure. Notice that in the original image, on the left, the edges of the painting appear to bow slightly outward. Pincushion distortion affects the photo in the opposite way, making center objects appear smaller and farther away. Barrel distortion makes straight lines appear to bow outward. The photographer applied the filter to create the second version of the subject in the figure, for example. Less helpful, in my opinion, is a related filter, the Fisheye filter, that actually creates distortion in an attempt to replicate the look of a photo taken with a fisheye lens. The extent of the in-camera adjustment you can apply is minimal. Additionally, it is a little difficult to gauge your results on the camera monitor because you can’t display an alignment grid over the image to help you find the right degree of correction. For those reasons, you might prefer to do this kind of work in your photo editor. Wherever you make the correction, understand that you lose part of your original image area as a result of the distortion correction, just as you do when you apply the Straighten tool. Distortion Control: Select Distortion Control, as shown on the left in Figure 10-7, and then press the Multi Selector right to see the screen shown on the right. An Auto option is available for some lenses, as long as you didn’t apply the Auto Distortion Control feature when taking the picture. As its name implies, the Auto option attempts to automatically apply the right degree of correction. 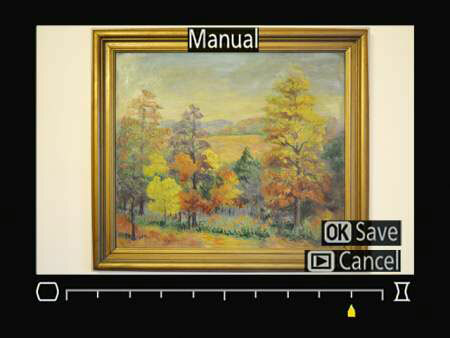 If the Auto option is dimmed or you prefer to do the correction on your own, choose Manual, as shown on the right in the figure and press OK. You then see the screen featured in this figure. The scale under the image represents the degree and direction of shift that you’re applying. Press the Multi Selector right to reduce barrel distortion; press left to reduce pincushioning. Press OK to make your corrected copy of the photo. Fisheye: After you highlight the filter name and press OK, you see a screen similar to the one in the figure, but this time, you see the word Fisheye at the top of the screen, and the scale at the bottom of the image indicates the strength of the distortion effect. Press the Multi Selector right or left to adjust the amount. Then press OK to create the fisheye copy.